A preventive oral hygiene appointment will follow with one of our licensed dental hygienists. This appointment may take place during the initial visit or may take place on a different day, depending on the patient’s individual needs. If you are only seeking cosmetic services, we can offer a cosmetic consultation for any new patient who is interested in creating the smile they have always wanted. When you arrive for your first visit, please be prepared to complete all insurance and health information forms that will allow us to begin your dental care. 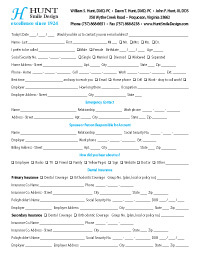 We will ask you to fill out several forms that will help you get acquainted with our office. If you would like to quicken your first check-in, you can fill out the New Patient Form on this page, and hand them in to to our front desk upon arrival. Payment is expected at the time services are performed, and we accept cash, checks, Visa, MasterCard and American Express. When insurance is involved, we can not guarantee estimated coverage, but we will do the best of our abilities to see that you receive your maximum benefits. Even so, you are responsible for your total obligation in the event that your benefits are less than anticipated. We will be more than happy to submit pre treatment estimates if you want to know what your expected coverage will be and we will also prepare all the necessary forms for filing for services. For larger cases, payment arrangements can be made through third party financing such as Care Credit, and we will assist you with the process.